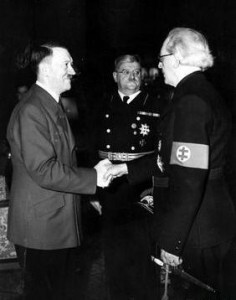 This week in the war, three more countries joined the German-Italian-Japanese ‘Axis’ by signing the Tripartite Pact: Hungary (20 November 1940), Romania (23 November 1940), and Slovakia (24 November 1940). Stalin had also been approached and was considering signing. Of course, Hitler had no intention of permitting it. He was planning to invade the Soviet Union early in 1941. The poster to the right appears whimsical to us now. It was printed in Japan to honour the 27 September 1940 signing of the Tripartite Pact by the original three members: Germany, Italy, and Japan. 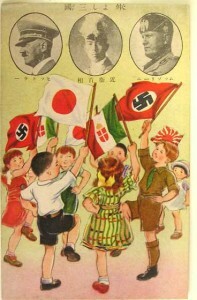 Inset bubbles show the three leaders: Adolf Hitler, Emperor Hirohito, and Benito Mussolini. Joining the pact was not equivalent to entering World War II. The Japanese did not enter the war until 7 December 1941 (Pearl Harbour time), when they attacked the still neutral United States and also British colonial possessions. 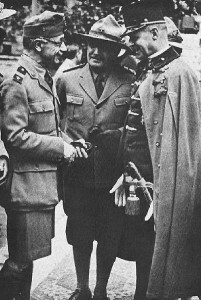 Despite the opposition of Hungarian Prime Minister, Pál Teleki (left), Hungary entered the war in April 1941, by joining the German invasion of neighbouring Yugoslavia. Romania entered the war on 22 June 1941, when the Romanian army joined the Wehrmacht’s attack on the Soviet Union—Operation Barbarossa. 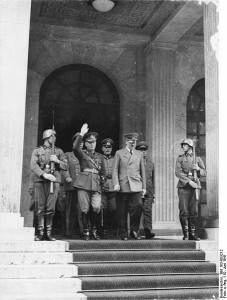 Romanian leader, Ion Antonescu, is shown with Hitler (above right). The Slovak Republic (Slovakia) was created after Hitler invaded Czechoslovakia and split the country (roughly) in two. The western part became the Protectorate of Bohemia & Moravia and was governed, for a time, by top Nazi Reinhard Heydrich. The eastern part of Czechoslovakia was renamed Slovakia. Slovakia entered World War II when the Slovakian army joined the Wehrmacht’s invasion of Poland in September 1939. (Which was well over a year before Slovakia signed the Tripartite Pact). The Slovakian Prime Minister Vojtech Tuka is pictured above and to the right. This entry was posted in World War II and tagged Axis, Heydrich, Hirohito, Hitler, Hungary, Ion Antonescu, Mussolini, Operation Barbarossa, Pal Teleki, Romania, Slovakia, Stalin, Tripartite Pact, Vojtech Tuka. Bookmark the permalink.